In recent news, the Supreme Court has sided with Ross and the Trump Administration by agreeing to block the questioning about Ross's decision of moving forward with the citizenship question on the 2020 census. As a result, the November 2018 scheduled trial on the census citizenship question was postponed because of the controversy. Moving forward, the New York attorney general, Barbara Underwood, is leading a lawsuit filed by 18 states and many cities to attempt to stop the Trump administration from adding a citizenship question on the 2020 Census. The Department of Justice is arguing against this because they are under the impression that this trial will be useless and wasting the government's resources because the Supreme Court may eventually rule in favor of the government. 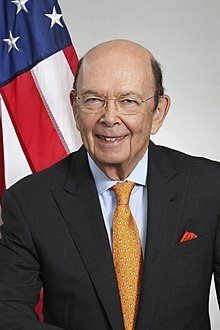 U.S. District Jesse M. Furman ruled against the Department of Justice and Wilbur Ross, stating that if the trial is delayed that the appeals process may not be done by summer 2019, the printing deadline of the census. Furman blocked the census question proposal on January 15, 2019, saying Ross had violated a "veritable smorgasbord" of federal rules, asserting Ross and his aides made false or misleading statements under oath. ^ Lynch, David J. (24 January 2019). "Wilbur Ross says furloughed workers should take out a loan. His agency's credit union is charging nearly 9%". Washington Post. Retrieved 25 January 2019. ^ Rogers, Katie (2019-01-24). "A â€˜Let Them Eat Cakeâ€™ Shutdown? Democrats Make the Most of an Administrationâ€™s Missteps". The New York Times. ISSN 0362-4331. Retrieved 2019-01-25. ^ "Wilbur Ross' Financial Disclosure Rejected by Office of Government Ethics". TheDailyBeast.com. February 19, 2019. Retrieved 22 February 2019. ^ "Acting Attorney General Whitaker Announces National Security-Related Criminal Charges Against Chinese Telecommunications Conglomerate Huawei". U.S. Department of Justice. 28 January 2019. ^ "Acting Attorney General Matthew Whitaker Announces National Security-Related Criminal Charges Against Chinese Telecommunications Conglomerate Huawei". U.S. Department of Justice. 28 January 2019. ^ "Chinese Telecommunications Device Manufacturer and its U.S. Affiliate Indicted for Theft of Trade Secrets, Wire Fraud, and Obstruction Of Justice". U.S. Department of Justice. 28 January 2019. ^ "Chinese Telecommunications Conglomerate Huawei and Huawei CFO Wanzhou Meng Charged With Financial Fraud". U.S. Department of Justice. 28 January 2019. ^ McIntire, Mike; Chavkin, Sasha; Hamilton, Martha M. (November 5, 2017). "Commerce Secretary's Offshore Ties to Putin 'Cronies'". The New York Times. ISSN 0362-4331. Retrieved November 5, 2017. ^ Mike Mcintire, Sasha Chavkin and Martha M. Hamilton (November 5, 2017). "Commerce Secretary's Offshore Ties to Putin 'Cronies'". The New York Times. Retrieved November 5, 2017. Wilbur Ross, the commerce secretary, retained investments in a shipping firm with business ties to Russian President Vladimir V. Putin's inner circle.